On Wednesday, OnePlus opened OnePlus Experience Store in Connaught Place, New Delhi. This is a state-of-the-art experience store that spreads over 3600 square feet. This store is the third experience store in the country after Bangalore and Chennai. 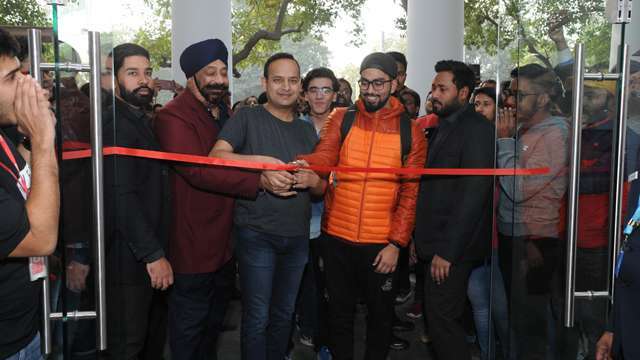 This store was opened on 13th December and inaugurated by OnePlus India General Manager Vikas Agrawal. During this time, singer, musician and YouTube Influencer Hardy Sandhu were also present. Let's say that, OnePlus 6T McLaren Edition has so much crazy inside people that at the time of the store opening, more than 1,300 people recorded their presence. Exclusive OnePlus and McLaren Goodies were also given to people reaching there with OnePlus Coffee Experience. For your information, let's tell you that OnePlus 6T McLaren Edition was sold exclusively on December 13 at this Experience store in New Delhi. If you talk about the specialty of this smartphone, then this phone comes with 10 GB RAM, 256 GB storage, McLaren brand logo and new Warp Charge 30 technology. In India this phone is being sold for Rs. 50,999. Well you can also buy the OnePlus 6T McLaren Edition from the e-commerce website Amazon and OnePlus India's official website, which is being sold from Midnight on December 14th. Other features of OnePlus 6T McLaren Edition include the Android 9.0 pie-based oxygen OS and 6.41 inch full-HD + (1080x2340 pixel) Amoled display, which has a protection of Corning Gorilla Glass 6. Apart from this, the phone uses the Octa-Core Qualcomm Snapdragon 845 processor and has a 3,700 mAh battery which supports fast charging. This phone has dual rear camera setup for photography fans, which supports 16 megapixels and 20 megapixels, while this special edition front camera is also 16 megapixels. Well, let's tell you that the Partnership of OnePlus, which recently made e-commerce company Amjon and the leading premium smartphone, has been completed four years. In this same delight, Amazon.in started a unique 'OnePlus Lucky Star' campaign with the help of OnePlus. The champion of this campaign, Shashank Shekhar, 24, has given more than 600 premium gifts in different categories.